The original FASTBACK™ was a bonded product that was first invented and introduced by George H Bullard and his son Robert back in the early 1960's. Following in the footsteps fo our past leadership, we carry on the heritage as we introduce the new, modified Type 29 RapidGrind™. 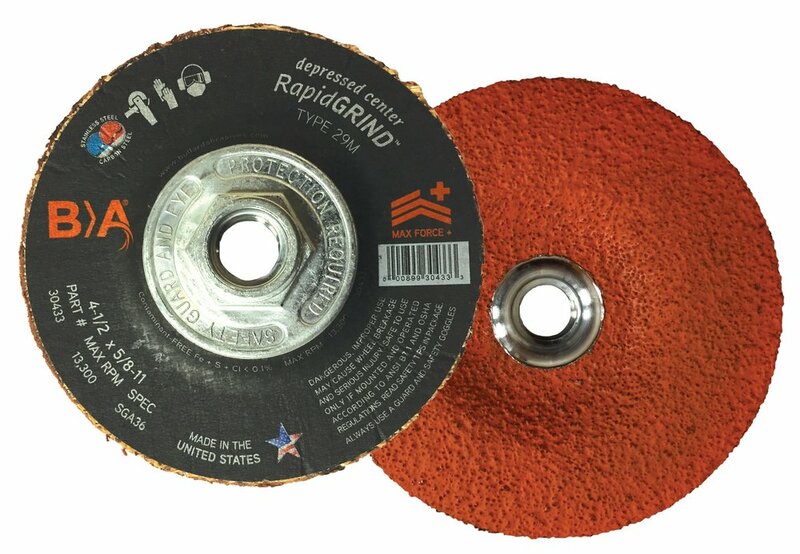 Unique product design which combines the toughness of a grinding wheel and the rapid material removal of a resin fibre disc. Superior ergonomic modified Type 29M angle design provides greater disc contact area on the work surface than the competitors providing the best solution when safety, speed and material removal are your primary goals. Reduced vibration through lightweight construction allows for an enhanced grinding experience and less operator fatigue.